The key people behind DC Universe Online headed to Comic-Con to discuss the upcoming massively multiplayer online game, a panel that included legendary comic book creators Jim Lee, Geoff Johns and Marv Wolfman, plus Sony Online Entertainment's Jens Andersson. Lee and Wolfman talked about the challenges of squeezing the 75-year-old DC Universe into the game, focusing on "the coolest characters, the coolest content" for DCUO, which is still in a pre-alpha state. Geoff Johns was the one on the DC Comics side responsible for the overarching story in DCUO, with Wolfman fleshing out the story concepts appropriate for the game. "If you think about a building, Geoff created the entire structure, the beams, now I'm filling in the individual rooms, the plastering," Wolfman said. "We're all coming up with story concepts that fit within the DC universe. They'll take up a paragraph I've marked up, and the developer turns it into 60 missions. It passes through us a second time to make sure it fits in the universe." 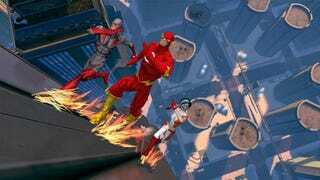 Those on the DC side sounded enthusiastic to be able to work within the broader confines of DC Universe Online, with Wolfman relishing the chance to write for the player who chooses to side with DC's villains. "In DCUO sometimes the hero loses," he said, noting that DC writers are "trained to have it the other way." Lee joked that it was challenging on the artistic side, making the transition from 2D comic book panel to 3D multiplayer online video game, bemoaning that "Drawing the other side of buildings was tough." "There is no map of Metropolis," adds Johns, one of two main locations that DCUO is focusing on for its initial release. But Andersson pointed out the depth of the game's interiors, particularly S.T.A.R. Labs in Gotham City and the thrill of "cleaning up all the disasters that happen there." "There's just too much cool stuff to put in the game at launch," Lee said, explaining SOE and DC's focus on two main cities. That obviously doesn't rule out other famous DC Universe locations in future expansions and patches, but considering the MMO is dated for "2000-something" right now, don't expect to hear anything about a Central City expansion any time soon. Lee did joke that the bottle city of Kandor, miniaturized by Braniac, would probably be the easiest, quickest to download city expansion. Sony Online Entertainment says the game is due to hit an alpha milestone "soon," but still has no release date to announce.